An ideal place to unwind on the weekends far from the hustle bustle of everyday din, Khandala is one of the major hill stations in India in the state of Maharashtra. Nestled at an altitude of 625 meters, it sits pretty on the western slopes of the Sahyadri mountain range. Gifted with abundant natural beauty, Khandala offers beautiful green environs and draws the interest of travelers from far and wide. A small but beautiful hill station, the town of Khandala provides a spectacular view of the lush green hilly surroundings. If you are tired of the daily work and toil, you can drive down a distance of 101 kms from the busy city of Mumbai to soak a few moments� peace and pleasure. It has several trekking trails around it which is a delight for the adventure lovers. Earlier, Khandala was a part of the terrain of Chhatrapati Shivaji. Later it eventually went to the power of the British. 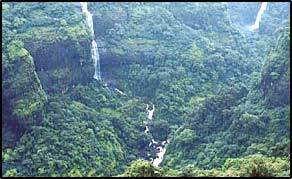 Khandala is positioned at the top end of the Bhor Ghat on the roadway between the Deccan Plateau and the Konkan plain. The Ghat serves an extensive amount of both road and rail traffic. The Mumbai-Pune Expressway, the main connection between the main cities of Mumbai and Pune, cuts through Khandala. Located barely 5 km from Khandala is the other famous hill station of Lonavala which also has the similar picturesque landscape as that of Khandala. There are plenty of lakes around Khandala like the Tugauli Lake, Lonavala Lake and Bhushi Lake. Also the Walvan Dam located here is worth visiting. Karla and Bhaja Caves, situated amid the hills 16 km away from Khandala, are fine places to visit. These rock-cut cave temples which date back to as early as 2nd century BC and are amongst the oldest and excellent instances of Buddhist rock-cut temple art in India adhere to the Hinayana sect of Buddhism. Amruntanjan point is another tourist interest that impresses its visitors to the core. Log on to www.touristplacesinindia.com which gives online information on Khandala on your tour to Khandala in India.